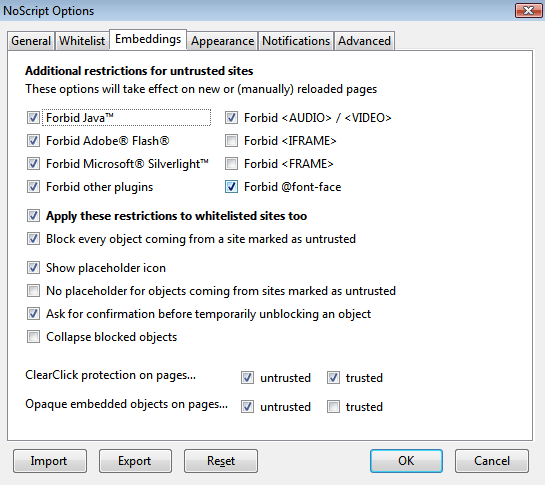 As you may already know, now that Mozilla has fixed the recent Firefox 3.6's "0-day" at light speed and vulnerability details are public, the feature protecting NoScript's users against this by default was Forbid @font-face. By allowing authors to provide their own fonts, @font-face eliminates the need to depend on the limited number of fonts users have installed on their computers. It really worries me that the FreeType font library is now being made to accept untrusted content from the web. The reason I don't want to do this blocking in Torbutton is because Torbutton is only about protecting users from privacy risks, not general security risks. Users who want enhanced security are encouraged to use your extension and others on our FAQ page.